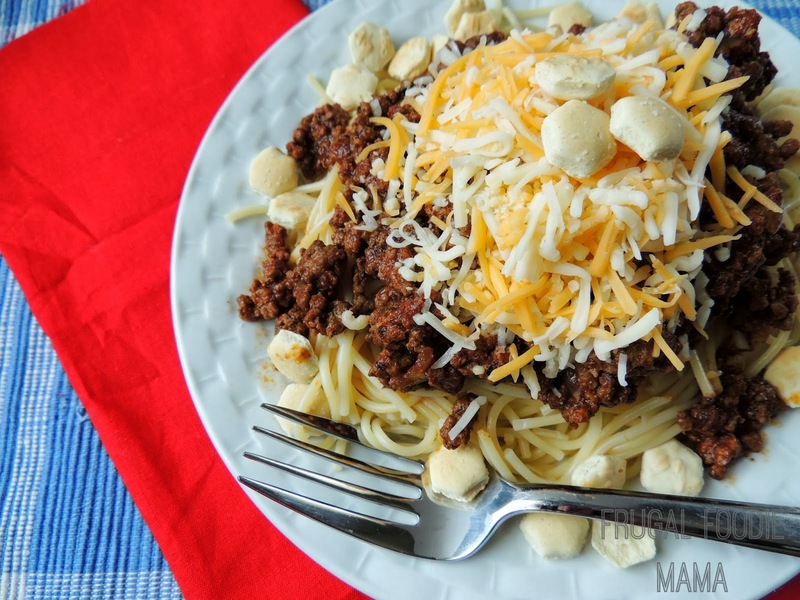 A Cincy 3-Way Chili is a heaping plate of spaghetti topped with a perfectly spiced tasty beef chili, that is then topped with a mound of shredded cheddar cheese and sprinkled with a packet of oyster crackers that comes on the side. Some like the oyster crackers... some do not. I am fan because I like the crunch that it adds to the dish. As some of you may have already picked up from following my blog, I moved from a small town in West Virginia to the big college city of Columbus, Ohio right after graduating from college. I taught junior high and high school for 8 1/2 years there until a turn of events sent my son & I back to our hometown. 8 1/2 years I lived there, folks. And I discovered the magic tastiness of the 3-Way Chili in the last 6 months that I lived there. Now, I had eaten my share of the Cincy chili or what some of you all may know as Skyline chili. But always on those little hot dogs piled high with shredded cheese. I often miss certain foods or dishes from the Columbus area, and I decided to try my hand at coming up with copycat recipes that will satisfy my cravings. Because let's be honest... an almost 4 hour drive isn't happening every time I crave one of my Columbus favorites. In a large skillet, heat a tbsp olive oil. Add the ground beef and season with salt and pepper. Lightly brown the ground beef, but do not cook all the way through. Drain off any fat. Spray the inside of a slow cooker with cooking spray. Add the browned ground beef. Dump in the rest of the ingredients (except the shredded cheese, oyster crackers, & spaghetti) and mix well. 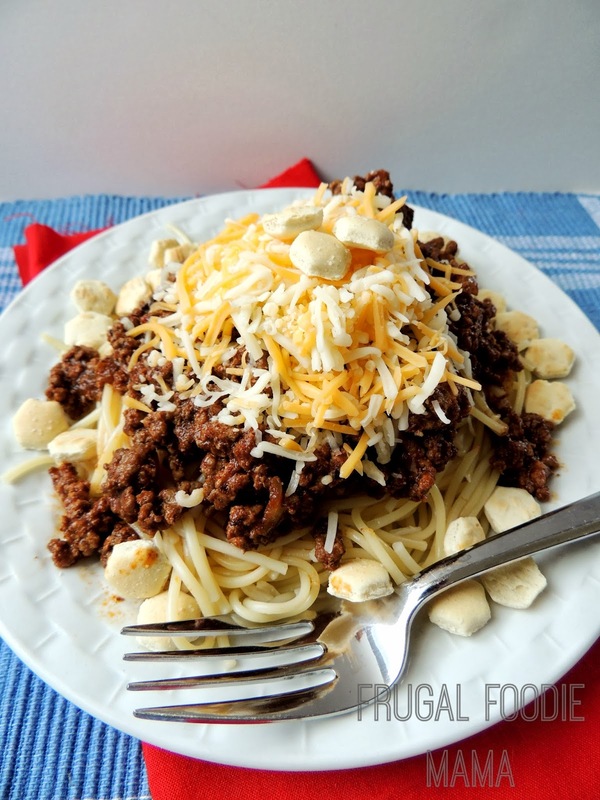 Serve over spaghetti and top with shredded cheese and oyster crackers. Recipe is adapted from THIS ONE from Stacy Makes Cents. If the idea of the 3-Way Chili doesn't appeal to you, this also makes an delicious chili to top hot dogs or fries with. 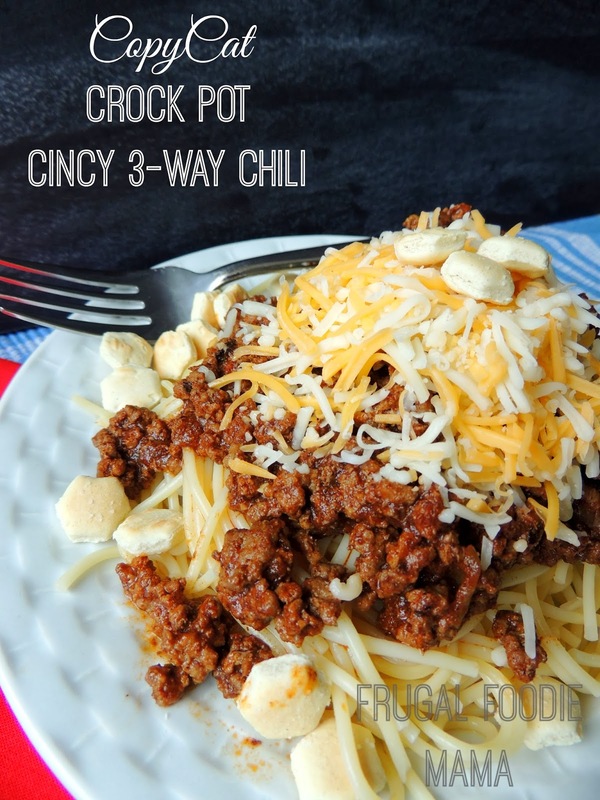 What I love about the Cincy chili is the warm spices- the cinnamon & allspice- that give it a smoky sweetness.